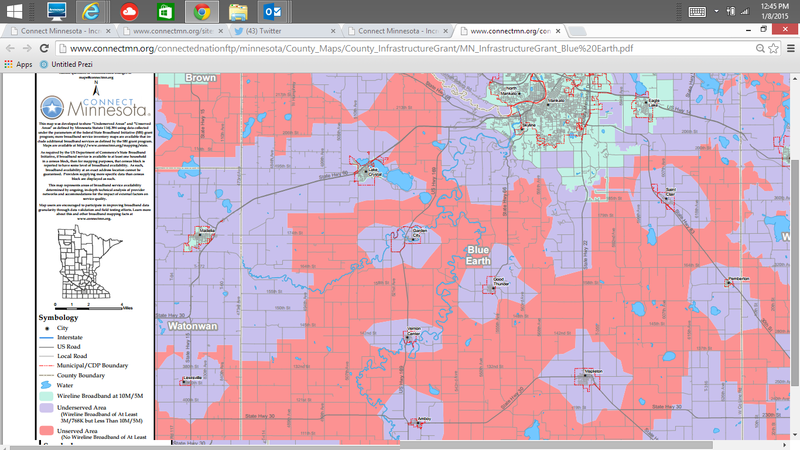 Blue Earth is a rural county – but the county seat is Mankato, which is certainly a bigger city so I was surprised to see that broadband coverage is only half if you don’t count mobile access. Also Blue Earth (like Benton County) is a county where mobile access makes a difference to local broadband coverage. Blue Earth has a long interest in broadband. In 2011, National Telecommunications Cooperative Association, Organization for the Promotion and Advancement of Small Telecommunications Companies, and the Western Telecommunications Alliance created a video to educate Americans about Federal Communications Commission (FCC) proposals that could profoundly affect rural America. Mankato has received a nice nod on the telecommuting efforts. They just need to work on ubiquitous coverage. If you look at the map you’ll see that Blue Earth County has a classic Swiss Cheese infrastructure. Mankato is green, which means served. The smaller towns are purple, which means underserved and between the towns the areas are red – unserved. How does Minnesota define broadband? Learn how the other Minnesota counties rank. How is Minnesota working to promote border to border broadband? In 2014, the Legislature approved $20 million for broadband grants to support broadband expansion in Minnesota. You can find a list of applicants online. The hope is the broadband sector is that more funding will be made available in 2015.